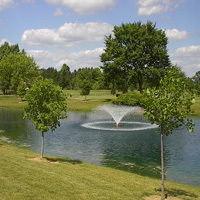 The site for this course is a wide drainage swale with a beautifully manicured pond at one end. Woerner-Temple Rd. borders the entire north side of the course and is of course out- of-bounds (traffic moves fast on this road so be careful!). 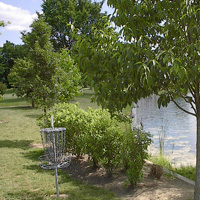 The south side of the course is bordered by a man made flood control mound. This course still has some design issues but has been greatly improved since our last visit with the addition of numbers on the baskets and above ground tee markers. They have planted many trees which add to the ambience but most are not in play because they seem to have been planted in more of a landscaping fashion and not as a hindrance to flight. This course is beautifully maintained and is developing into a first rate beginners course. Flying discs and fast moving traffic can be dangerous! In the far northwest side of Columbus (Dublin Area); Exit I-270 west on Tuttle Crossing to Emerald Parkway. Turn right (north) on Emerald Parkway. Take Emerald Parkway north to Woener-Temple Rd (the first light). Turn left (west) on Woerner-Temple. Go approximately .5 miles (you will see pole holes on the left) and turn left on Norn St. Parking is along the road. 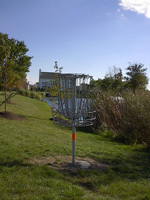 The tee for the first hole is on the east side of the pond.